Jacob Miller is looking forward to Wakefield's first competitive run out at Belle Vue this year. Trinity skipper Jacob Miller feels there is more pressure on Wakefield to perform this season. 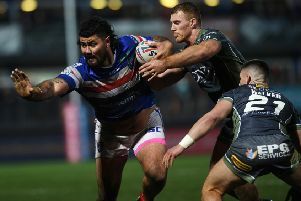 The Australian half-back was part of the Wakefield side that finished fifth in Super League in 2017 and 2018. Miller scoring against Hull FC at Belle Vue last season. A structure change ahead of the current season means that a third-straight fifth-placed finish for Wakefield will see them qualify for the play-offs. And, according to Miller, that brings more expectation for the team to succeed this campaign. "There is a little bit of pressure and we have probably put a little more pressure on ourselves," said Miller, who scored in Trinity's 42-24 defeat against London Broncos last weekend. "We have fallen short of the play-offs two years in a row now, so we obviously want to go that one step further. "There is a little bit of pressure from the outside, but we have got to deal with that and start putting in some good performances." MIiller will be hoping that the "good performances" can begin when St Helens visit Belle Vue on Sunday. The 2018 League Leaders' Shield winners have won four of their last five games at the Mobile Rocket Stadium. The 26-year-old is anticipating a "real tough" contest against a side who opened their Super League campaign with a 22-12 victory over Wigan Warriors. He added: "They are one of the form teams in the comp, with the way they went last year and the way they started against Wigan. "They are going to be real tough to beat and hopefully we can pick our performance up and be better this week. "We have been preparing really hard this week, they are a good team with a big forward pack. "Every single one of us is going to have to be on our game individually and collectively." Wakefield go into Sunday's clash hoping to bank their first points of the season. Chris Chester's side were on the end of a surprise defeat against London last weekend but Miller insists that there is no need for panic. He said: "It is one game, it is definitely not panic stations or anything like that. "We are disappointed with ourselves, we had a really good pre-season and to start like that was no good for anyone. "We will be looking to have big week and put things right against St Helens."